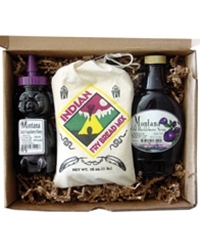 Our Indian Fry Bread Shipper includes one 12oz Wild Huckleberry Honey, one 10oz Wild Huckleberry Syrup, and an indian fry Bread mix. 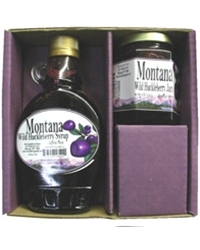 This Medium Shipper contains one 10oz Syrup, and one 8oz Jam displayed in an attractive colored gift set. Available in different falvor:Wild Huckleberry, Sweet Cherry, Prickly Pear,Wild Blueberry, Wild Blackberry, Wild Marionberry, and Cranberry. 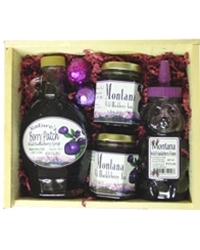 This Large Shipper includes one 12oz Honey, one 10oz Syrup, and one Pancake mix. 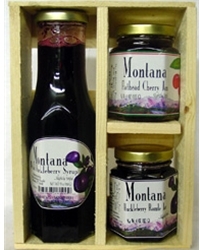 Available only in Wild Huckleberry, and Wild Blueberry. 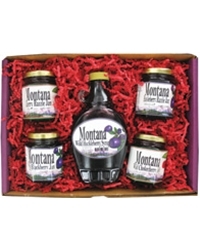 One of Best Sellers with two 5oz Jam of our selection. 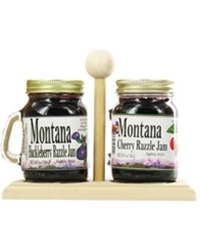 Our Shadow Box features one 10 oz jar of Wild Huckleberry Syrup, one 4oz jar of our Wild Huckleberry Razzle jam, and one jar of our 4oz Cherry Razzle jam. The Super Combo features two 4oz jams of our selection, one 10oz jar of Wild Huckleberry Syrup, one 12oz Wild Huckleberry Honey, and two cordials. 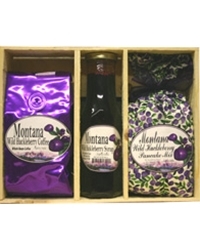 The Morning Trio offers one 10oz Wild Huckleberry Syrup, one 8oz Wild Huckleberry Coffee, and one 16oz Wild Huckleberry Pancake Mix. A must have for all breakfast lovers.